Several times every spring and fall, one can hear (and hear for quite a distance) an unusual family conversation across the hills, wetlands, and farm fields of south-central Wisconsin. The opening remarks come from above. 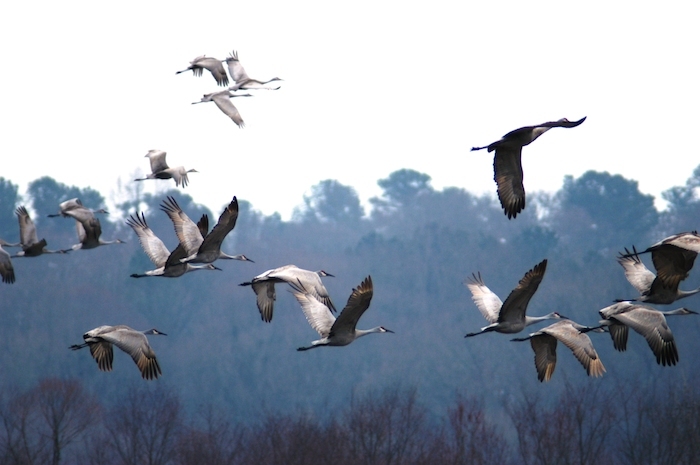 A flock of migrating Sandhill Cranes will call from the skies over the International Crane Foundation (ICF). Their rolling rattle will prompt other cranes, earth-bound, to raise their voices. As the curious Sandhills drop in to pursue the discussion, excitement spreads like a rumor from crane pen to crane pen. The heads of a hundred and twenty cranes lift up, long necks bend back, and the bugles cut loose. The clamor shakes the fences and lifts the attention of neighbors. Even the resident crane biologists and ecologists, who know these voices well, take note. Amid the uproar of trumpeting cranes, the discerning human ear can make out the family’s varied voices. The more “primitive” species—the Gray and Black Crowned Cranes from Africa—utter short, guttural honks. Those with more elaborate, elongated tracheas—the Whooping Crane, Red-crowned Crane, and Sarus Crane—speak out in bright, stentorian tones. Siberian and Wattled Cranes occupy the higher register. And somewhere in the din the wild Sandhill Cranes issue their coarse, rattling calls. A human being eavesdropping on crane-talk picks up undertones of irony. Having spent eons diversifying from their common ancestor and following their own evolutionary paths, the cranes have now been reunited by their increasing vulnerability. This seasonal dialog between wild and captive cranes is symbolic of the situation that Earth’s biological diversity in general faces. As ecosystems of all types are degraded, their processes disrupted, and their species and populations threatened, the captive breeding of endangered species has become more necessary. But such programs are expensive and labor intensive, and do not address the forces affecting the places where our fellow creatures evolved and in which they subsist. The conversation among the cranes thus echoes our own discussions about how to maintain a biologically diverse world, how to connect the wild and the domesticated, how to foster a culture of care and conservation. Cranes are among the most endangered families of birds in the world. Eleven of the fifteen species are threatened with extinction. Many populations and sub-populations of even the more common species are at risk. The size, ecosystem requirements, and migratory ways of cranes make them vulnerable to a wide range of threats: loss and degradation of wetlands and grasslands, growing pressures on river systems and other freshwaters, illegal wildlife trade, poaching, poisoning, climate change. In many places cranes have assumed the role of “flagship species,” catalysts for efforts to protect and restore diversity and ecological health in the ecosystems where they occur. Despite the vulnerable state of many species and populations, cranes are in a sense more fortunate than many other endangered forms of wildlife. They are among the most intensively studied families in the bird world. In most of their home places around the world, they are loved and even revered. Their beauty, behaviors, and cultural value provide special opportunities for conservation education and action. Cranes also have the benefit of their own foundation. ICF, since its founding in 1973, has served as a focal point for a global community of researchers and conservationists. Working with and through colleagues around the world, ICF helps to coordinate field work in landscapes and ecosystems—what conservationists refer to as “in situ” programs—and the work that goes on in labs, breeding and rearing facilities, and education centers (i.e. “ex situ”). In this coordinating role ICF provides an unusual model for zoos as they evolve to become centers for conservation education, action, and leadership. ICF is one of the 230 accredited members of AZA, the Association of Zoos and Aquariums. For many of its visitors, ICF is in essence a crane zoo. However, unlike most other “zoos,” ICF did not evolve to take on a conservation mission; it began with conservation as its mission. From its founding it has integrated in situ and ex situ work. In has sought to be, in effect, an “inter-situ” organization, connecting its work with wild birds, populations, and ecosystems to its work within human institutions, landscapes, and communities. In its early years ICF devoted special attention to the development of captive breeding techniques and programs, an insurance policy aimed at securing the survival of the rarer crane species when information on their status in the wild was scarce. Such work is now a relatively small part of a much broader portfolio of conservation actions. Look on ICF’s webpage and you will find listed the many conservation programs that this “zoo” works through: safeguarding crane populations; securing ecosystems, watersheds, and flyways; improving local livelihoods; bringing people together; securing water resources; promoting clean energy; conserving biodiversity on agricultural lands; addressing climate change; championing land stewardship; building knowledge for policy and action; advancing conservation leadership. While ICF’s “zoo” function continues, it serves an expansive mission: to connect visitors to the wide world of conservation. The Sandhill Cranes, calling out to their extended biological family, provide that connection for all who care. Only a few decades ago, the Sandhill’s voice was all but stilled in the upper Midwest. Reduced to only a few dozen remnant wild birds in the 1930s, persisting in Wisconsin’s most remote wetlands, Sandhill Cranes have now reclaimed this portion of their ancestral range. Thanks to a combination of education, ecosystem restoration, research, and effective hunting regulation and management, Wisconsin is now home to more than twelve thousand cranes. The breeding population has spread to neighboring Minnesota, Iowa, Illinois, and Upper Michigan. As the wild Sandhill Cranes continue on their flyways, following their migratory hopes and callings, this is the encouraging message they share with their relatives in Crane City. Zoos and aquariums increasingly exist, as ICF has from its beginnings, in an inter-situ world. No longer places where animals are displayed as mere objects of entertainment, zoos are becoming ever more important spaces at the intersection of the human and the wild, of education and action, of curiosity and commitment. Perhaps we will come to a time when our caring will achieve conservation, when the boundary between in situ and ex situ will fade and conversations about humans and nature will flow more freely in both directions. Until then, we listen across that boundary line with mixed feelings and longings, in wonder and in irony. IUCN. (2015). The IUCN Red List of Threatened Species. Version 2015-4. Retreived from http://www.iucnredlist.org. Association of Zoos and Aquariums. (2014). Retreived from https://www.aza.org/. International Crane Foundation. (2016). Retrieved from https://www.savingcranes.org/our-work/. International Crane Foundation. (2016). Annual Midwest Crane Count. Retreived from https://www.savingcranes.org/education/annual-midwest-crane-count/. Photo by Joe De Vivo. Curt Meine is a conservation biologist, historian, and writer who serves as a senior fellow with both the Aldo Leopold Foundation and the Center for Humans and Nature, and as associate adjunct professor at the University of Wisconsin-Madison. He has written several books, including Aldo Leopold: His Life and Work (University of Wisconsin Press, 1988).